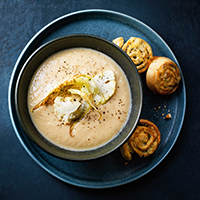 The whole family will love this creamy soup with delicious Gruyère twirls for dunking. Using ready-made frozen pizza dough makes for tasty twirls that are easy to create. You can also use a sheet of puff pastry cut to the same dimensions if you prefer. 1. Preheat the oven to 200°C, gas mark 6. Discard any large outer leaves from the cauliflower, but keep the smaller, tender ones. Cut the cauliflower into florets, then roughly slice. Heat the butter in a medium pan. Add most of the cauliflower (set aside a handful along with the tender leaves), the shallots, garlic and a good pinch of salt, turning in the butter. Cover, fry gently for 10 minutes, stirring occasionally, then uncover and cook for another 5 minutes until just taking on colour. Pour in the milk and simmer gently for 5 minutes, then add the stock and simmer for another 5 minutes. 2. Toss the reserved leaves and sliced florets with the oil and arrange on a roasting tray. For the cheese twirls, roll out the defrosted pizza dough to roughly 25cm x 20cm. Scatter with the cheese, poppy seeds and rosemary, and roll up from one of the shorter ends. Cut into 12 pieces with a serrated knife, then arrange on a baking tray, pressing down slightly. Bake the cauliflower for 10 minutes and the twirls for 15 minutes. 3. Blend the soup with the lemon juice until smooth, adding more milk to loosen. Reheat the soup, ladle into bowls and scatter with the roasted cauliflower. Serve with the twirls. This recipe was first published in Thu Jan 24 14:58:00 GMT 2019.